This product has made life so much easier whilst getting ready for a day out, and preparing for the night; especially when my daughter was waking for 3 bottles a night. This product means you can be prepared with the right amount of milk and can simply mix together quickly to make a bottle which is what you need with a hungry baby! The one thing is you have to make sure you have wiggles all the powder out of the dispenser, especially when your half asleep which is a lot in the first few months! Absolutely amazing product, it's so easy to use. Perfect for when you are about and about with baby. We used this with our first and now using it again with our second. The three compartments make it great for long days out, or travelling so that you do not need to take the whole tub of milk with out. Would not be without this. This product is a godsend! 3 compartments make it perfect for storage in your baby bag!! I use this product for my baby boy. With a 4 month old and a 3 year old life is better when it's at its simplest. I can use this item with ease, it fits perfectly in an electronic steriliser and is handy for in the go busy mums. Being a 3 compartment milk holder it saves having to make up 3 seperate pots saving space in your baby bag and also time rummaging for a pot that isn't empty. I highly recommend this product! These are fantastic for parents on the go. Only downside is that there wasn't enough room for large quantities of scoops. I have been using these tubs (got 2 of them) for 4 months now. Very useful when going out just pop some baby formula in and its easy to pour into a bottle. Its Good quality product , easy to wash and use. Really pleased with it. Milk can spill out. Only holds up to 7 scoops of powder. This product is great for moms who always travel or are always out of the house and don't have enough space to carry the massive tubs of powder. 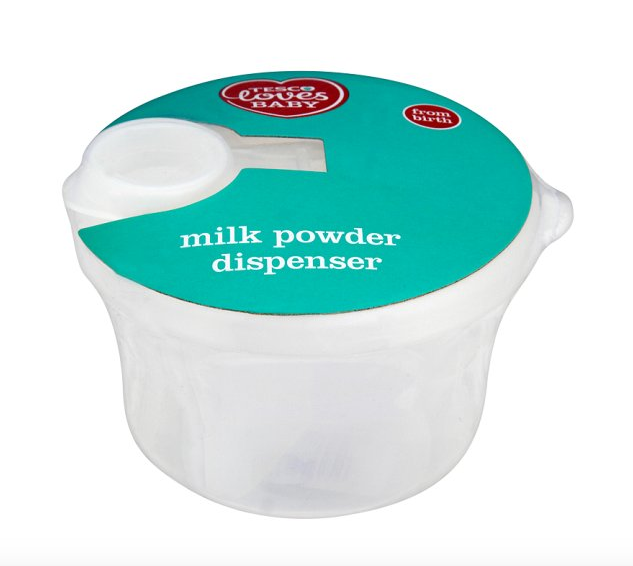 The little powder dispenser makes carrying powder around easier due to it being able to store in small spaces. I found that without the powder dispenser I would be lumping around a massive tub of powder and adding to much weight to the pram or bag. Only problem that I find is sometimes the powder when making a Bottle can come out and not all end up in the bottle. Also it only holds 7 scoops of powder which is disappointing because it a great product all together. This went with me everywhere! Was so convenient to be able to measur the milk for the day and go! The cap was easy and secure and was good as depositing the milk into the the bottles when needed. The only problem would be when the powder got stuck in the corners could be hard to clean. Sections allowed exact amount of scoops per feed and easy prep if a day out is planned. I used one of these with my first born. It came in so handy on preparing days out I didn't have to worry bout taking out a tin of milk and preparing scoops at each feed. I knew each section had the exact amount needed and the compact size of the product made it easy and simple to pack within your baby bag. Was a brilliant little accessory and will be purchasing another for this next baby. I could live with out this with my second child as couldn’t breast feed and was easier to take out and about rather than the box of milk. Will definitely be getting more if I have to bottle feed again I’ve bought for all my friends who are pregnant just incase they didn’t want to take the powder box with them also. Powder can become stuck in the top if becomes wet. This is a great product. Its a spacesaver for when youre out and about. No need to measure out the powder as youve done that at home. I bough this handy little tub for when my daughter is with family . It’s definetly worth the money and is helpful for when I’m out and about I can put the right amount of formula in each section and use straight away . The only cons I have for this product is if your child is on more than 5oz there isn’t space for any more formula in each section so hasn’t been used since my daughter has been on 7oz. Also when I was using the product if you didn’t dry it tidy or when putting it into bottles and the steam would get in the pot the formula would get awful sticky and hard . The lid is also a pain to clean in small areas. Even with these minor issues it’s definitely worth getting from birth until their on more oz ! This really helped when out and about with having pre measured formula for my baby. Can make the formula stick if not dried properly. I loved having a few of these accessible. It was really useful when my son first started nursery as the formula was already measured out. Once your baby is no longer on formula, it can be used for snacks. Easy to use. Lightweight. Compacted to fit in bag. This product is a must have for when your on the go. You can get 4feeds worth in them. Rotation on so easy to pour into bottles and fits in your bag nicely rather than carry a whole milk tub. I love this product. For such a small price this product is easy and compact when feeding away from home. Sometimes the milk can get blocked in the lid. I absolutely love this product. I bought this one and a mam one however, they both do exactly the same job and the Tesco one is 4 pound cheaper. It stores powder safely and I have never had a spillage, as the lid is tightly locked on. I used to panic as to how I would make my babies bottles safe when I was out and about but this product put me at ease and easily fit into his changing bag. I love this product, it makes it so much easier to take formula out; I know I’m emptying the exact amount. It is small and compact that it will fit great in her changing bag. Wish it was a bit bigger with either another compartment or taller to fit in more formula as I put in 6 scoops and it’s very almost to the top however that wouldn’t stop me using and recommending the product. 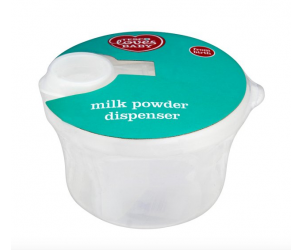 This Tesco Milk Powder Dispenser features 3 compartments; ideal for storing milk powder when you are on the go. Dishwasher safe (top rack only) and suitable for all forms of sterilisation.